If you are planning a shower, you've come to the right place! Lots of shower ideas for your bridal shower and baby shower...especially games! Whether an intimate gathering or something on a larger scale, these parties are always a cause for celebration! Make it memorable, easy and fun! Often at a party of this nature you'll have several guests who don't know each other. Playing simple games is one of the best ways to encourage conversation and give people something to talk about it. Having an activity puts people at ease, and will set this event apart from all the others! 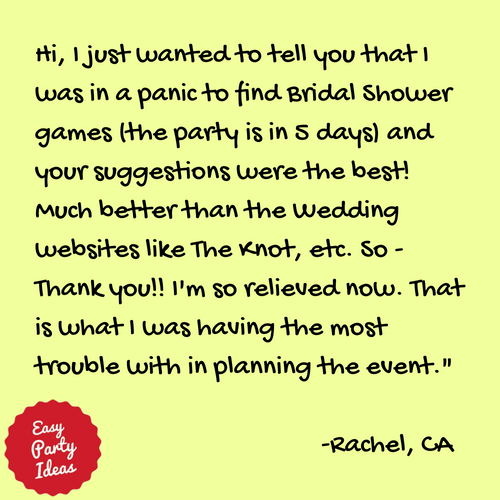 There are many traditional game and themes for wedding showers, but I think it is always good to look at a complete list of options so you can pick exactly what the Bride and her guests will enjoy most! Links below will take you to pages that include lots of choices for you when planning the perfect shower for the Bride-to-be! Fun Baby Shower Game Ideas Add some spark to your baby shower with these game ideas including ice breakers, themed games, shower activities, game supplies and more! This link takes you to a great site full of lots of great baby shower ideas. Baby Shower Games available from PrintGamesNow are so easy! Just purchase, print as many as you need, and they are very inexpensive! Bachelorette Party Games - These free and easy games for a bachelorette party will create lots of fun memories with lots of laughter! Giving a gift basket? Make it look great! !